It was a cold evening. He was sitting near his tent, shining his gun. In a split second a heavy snow boulder fell on his head. He saw his fellow soldier losing his balance and falling down the cliff. He felt dizzy, images around him were blurry. All he could sense was numbness that were transforming into scathing pain.
" Hi, I think I like you Rajiv"
" I am honored, because not many women would take the first step to say this to a man. I like you too"
" Glad you said that. I was thinking how you would react"
" Actually I am very happy today Sonia"
"I think It is high time that you got married"
"I need two more years amma. 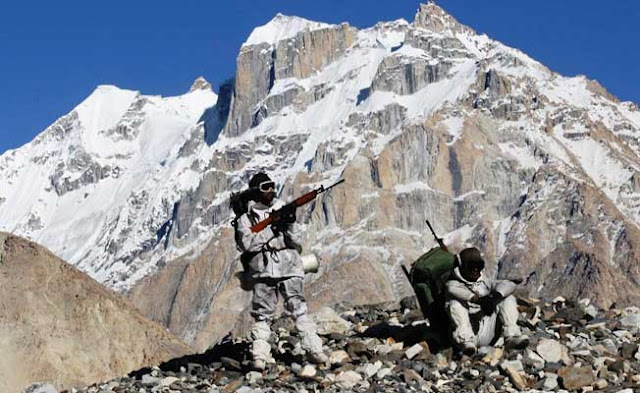 I might be posted in Siachen"
"Do you really have to go all the way to Siachen?" " Siachen is a challenging place amma and only the fittest can survive there. I have to be there for our country"
" I am proud and at the same time scared. But marry Sonia first and then go to Siachen"
His broad shoulders suddenly became numb. He searched for his gun. It was buried somewhere around him on the snow. He could not lift his left hand. He felt something break inside. He coughed a little and saw blood dripping from him mouth on to the snowy ground.
" You look lovely tonight"
She was silent which was so unbecoming of her. It was her first night after her wedding with Rajiv.
" Can I see that smiling face of yours?" It was a different feeling for her. She was thinking to herself how a first night can suddenly change her. She was actually the first one to propose to Rajiv. But tonight, she felt different. “Why this silence? Don't you like me"
She tried to respond. But words did not escape her mouth. She just looked into his eyes. Their glances spoke the language of love. The romantic vacuum was so thick that one could actually cut it with a knife. He understood the language and pulled her towards him and she just sunk into that heavenly embrace that ignited their journey of love after their marriage. He was a brave man. But the sight of his own blood terrorized him. He coughed again and almost a liter of blood came out. There was silence all around. He did not even have the strength to cry out loud and ask for help. He could not move his head too. “But I don't want you to go now. Stay for some more time"
“I already told you about my situation. I can't leave the army now." He tried to move forward; but his body was not cooperating with him. He could only roll over and lie on the snow capped mountain. All he could see was the sky. Snowflakes were falling on his face. He could not lift his hands and wipe them off from his face. His eyes were filled with tears. “I don’t want my husband to risk his life in that dangerous place"
“There is risk involved in every job. Aren't you proud that I am defending the country?" “I am proud. But I love you and I am scared"
He pulls her towards him, gives her a long hug says “Where is the boldness that made you to first approach a guy like me?" Somehow a small hug brings a smile on her face. Her smiling face evoke a mixed emotion of happiness and sadness. As he slowly walked away into the distance, the first tear drop fall from her eye. He wanted to live. He could feel pain all over his body. He could feel pain inside him. Images of his wife flashed across his thoughts. The last time he received a mail, she had hinted of divorcing him. He wanted to talk to her now and explain his situation. As a husband he had failed to be by her side. As a son of the soil, he had tried his level best to safeguard the country. "I should not die now. I want to fight for my country" - His thoughts did not communicate with his vocal cord. "I won't shut my eyes. I want to see the world". Another boulder of snow fell on him and it was all over. Under the snow, the heart was still beating; but there were no one to feel that heart beat that was slowing down. When she finally folded the letter, she began to cry out loud. Sixty feet under the snow, another heart hardened, froze and rested. Dedicated to Lance Naik Hanamanthappa and hundreds of soldiers who have served our country. The idea for this format of storytelling is based on an Inspiration from the narrative style of Manoj. Thanks to him for making me write this. I had been a silent follower of your blog for quite a long time now but Chriz, this post struck a chord with me. Kudos to you for such a soulful write up. To bravery, to sacrifice and to patriotism - a big salute to all the soldiers out there.